The Monadnock Folklore Society is excited to present Blue Moose and the Unbuttoned Zippers at the Nelson Town Hall on Friday, March 19 at 8:00 PM. Admission is $12/$9(senior, youth). Founded in 2006 by four Berklee College of Music students, BMUZ decided to do something really different. 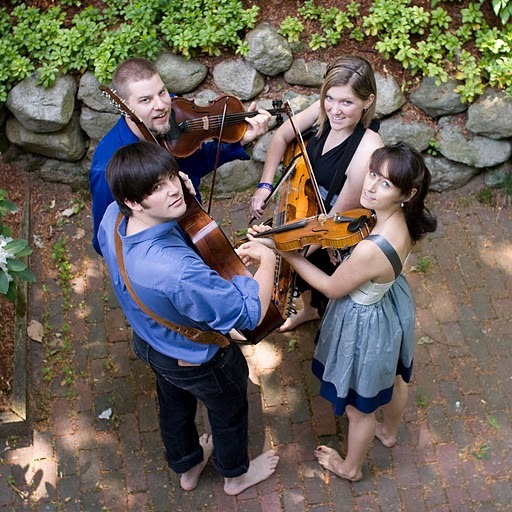 They combined Scandinavian music and a nyckelharpa with American Old Time music, four and five string fiddles and a jazz and bluegrass guitarist. The result? A contemporary string band filled with epic triple fiddles, catchy melodies and driving rhythms full of raw energy and mashy quirk. Although they think of themselves as a musical unit, the members of BMUZ each have their own individual sound. Bronwyn Bird grew up performing in musical theater. As a teenager, she discovered a nyckelharpa hanging on a neighbor’s wall, and quickly fell in love with the instrument. While spending a year in Sweden studying Swedish music, she built the nyckelharpa she currently uses. Andy Reiner grew up in a musical family and spent his childhood attending music camps where he was exposed to a myriad of styles of folk and contemporary music. He can’t choose which genre he likes playing the most, so he tends to successfully mesh them all together. Stash Wyslouch thought he was going to be an engineer until quite recently. His music has moved from heavy metal to bluegrass and jazz and draws on his Columbian and Polish background and love of reggae and funky grooves for his quirky compositions. Mariel Vandersteel grew up playing traditional Irish, Scottish and Quebecois music at contra dances as well as touring with Alasdair Fraser and the San Francisco Scottish Fiddlers and with the Black Brothers. Before Berklee, she spent her summers studying music in Ireland and across the US and has spent four months studying the hardingfele in Norway.